Well bangs goes my diet, now I've seen your cupcakes! They did a great job and that link came at the right time as Graham's watch strap burst and it's not fixable. As usual your cakes look amazing. You have managed to make the vanilla cup cakes look so exciting by the way you have arranged them. A belated happy birthday to your hubby. Thankyou Mina I will pass on the message. Feel like licking that buttercream, cupcakes looks adorable, i think i just cant stop with one. Priya next time you come to UK I will bake them for you. 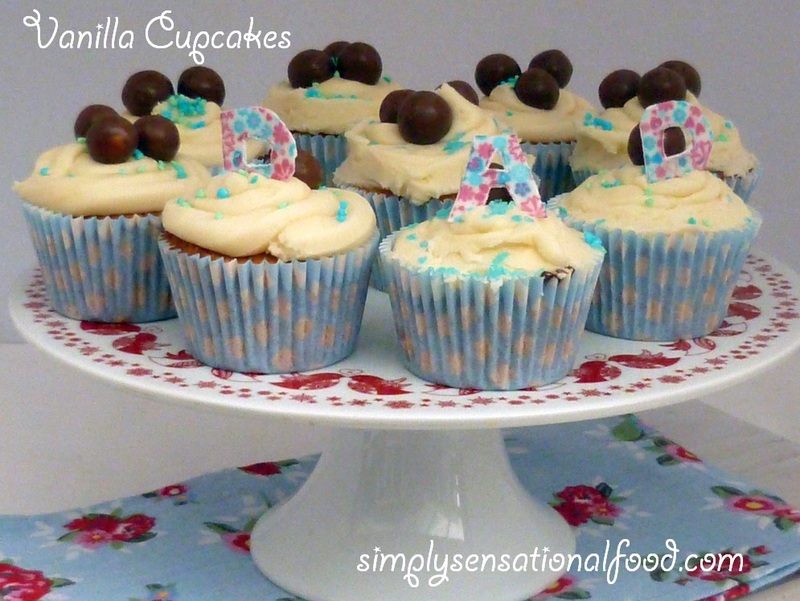 Lovely vanilla cup cakes.. will make them for my grand daughter when I visit in July. He really did, it was lovely. Awww these cakes are so cute! The recipe looks pretty simple. I'll give it a go...one day. Mez I hope you do. Yum they look delicious! I like the idea of putting malteasers on top. The cupcakes look beautiful! Do you think they would work with gluten-free flour? 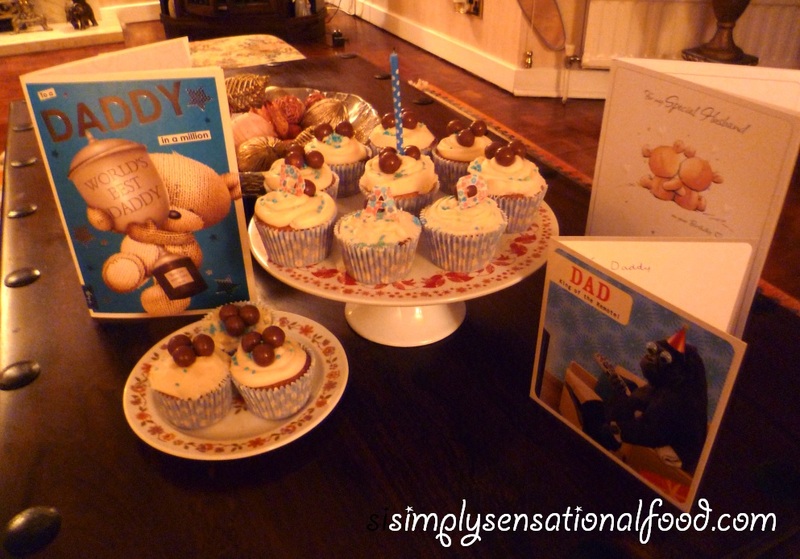 What a lovely sight for your husband to see on his birthday - those cupcakes look yummy! Yes he was pleased as the girls were were so excited to give him the cakes. A lucky man to get that watch! Laura these only took about 45 mins to make, including decoration. delicious cupcakes and even more special when made by kids. Gorgeous looking cakes and your phptos are fab as ever. Do you use something to get the background so clean and white looking? I use white card or white sheet to get white back grounds. The fondant sheets come in all colours but I think ours had dried out and kept crumbling when we were trying to cut them..
Ooooh who doesn't like cake on their birthday? And homemade cake at that!! Your girls did a fab job with these. Ooh I love cupcakes and they look yummy! Baking with kids is a lovely personal touch for a special birthday treat! It beats shop bought cakes any day and cup cakes are much easier to manage. I like vanilla cupcakes too , plain and simple but soft and spongy. Great job, those cupcakes are so versatile. Lovely cakes. I bet your kids' dad was really chuffed. Looks like your girls went to lots of effort. They did and we really enjoyed them. These look yummy! I like how they are laid out, great for a birthday! Sweets are great way to decorate cakes. They look SOOO good!! I need to make those!!!! They look SO good, I NEED to make those!! Gemma your combination sounds amazing. The cakes look delicious. I am a sucker for cake! 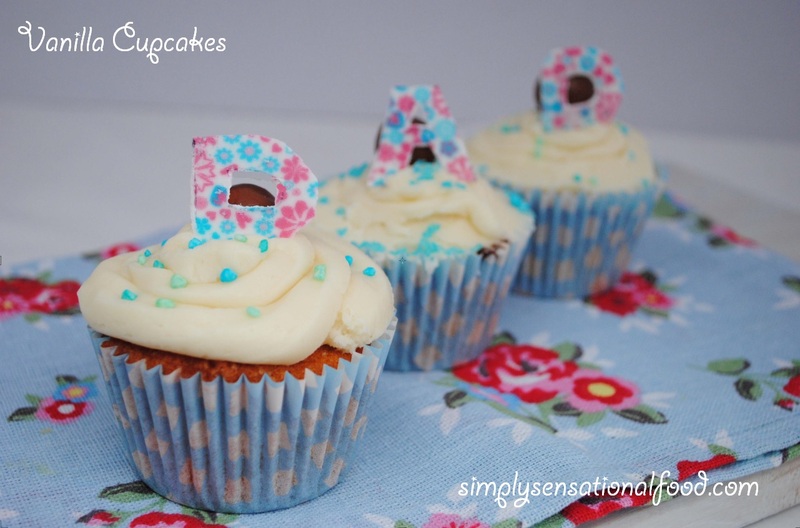 I really love vanilla in cakes and these ones look amazing! I bet your hubby was really chuffed with them :) I really like your cake plate too, really keen to get one of those. Suzanne, I bought it at Christmas from their home ware section. A new watch and cakes sounds like a great birthday treat. And you made all things colour coordinated, really nice. They look really good and I could just eat cake now after seeing them! They look delicious, I really need to start baking again! Angela, so glad you were happy with them. These look so yummy. The Daddy must have been super pleased. lovely, I love a good cupcake! I love the idea of cutting out the letters - so effective when decorated. These cupcakes look gorgeous and relatively easy to make - even with my horrendous record in the kitchen i should be able to manage these! Booked marked for Father's Day! I am actually baking some of these today with my youngest daughter for grandma, who is not well at the mo! I'm sure they will cheer her up! I want some of these!!!!!!!!!!!!!!! They look great. Will have a go at making these with my niece.